Why is it that Catholics travel great distances to shrines of Our Lady collecting holy cards, statues, or medals with her images? Non-Catholics will scratch their heads, or frown on what they believe is misplaced devotion meant only for God. But just as it is only natural for a child to seek and long for the faces of their mother and father whom they love, we too seek and long for the Face of the Father, being made in His image and likeness, and also search for the loving face of Our Mother, given to us by Jesus from the Cross, so that she may help form us into the image of her Son Jesus Christ. Every image of Our Lady comes with a title that reveals a particular aspect of her love and intercession for her children in need: Our Lady of the Rosary, Mother of Perpetual Help, Mother of Divine Grace, Spouse of the Holy Spirit, etc. A list of her images and titles gathered from all over the world may number in the thousands, but the oldest known image is said to date back to the first century, originating from the Holy Land or Syria. It is an icon that, tradition tells us, was painted by St. Luke himself in encaustic, an ancient painting technique with hot wax and resin. Brought to Rome to save it from destruction during the iconoclasm of the Eastern Church, it is a treasure that has been hidden away for centuries. 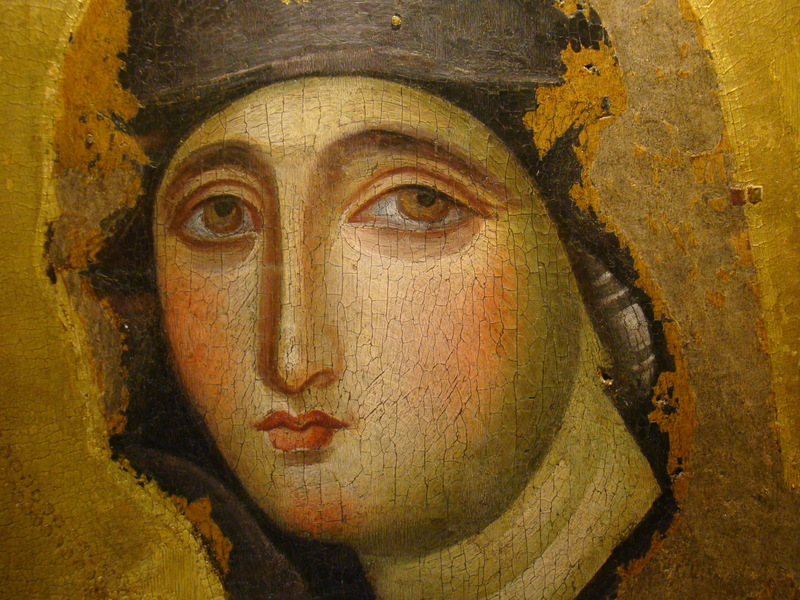 Although the fragile linden wood icon is now worm-eaten and crumbling, the face of the Blessed Mother remains, and it is exquisite! She is known by a very unusual name — the “Advocata Nostra,” Our Lawyer. Our Lawyer? It may seem an odd title; however, the name “Advocata” or lawyer is most fitting. Mary, as Spouse of the Holy Spirit the Advocate, undoubtedly received even greater gifts of the Holy Spirit as she prayed in the midst of the Apostles at Pentecost, she herself becoming an advocate for the children of God. The rich history of the icon includes Pope Sergius III moving the beloved image from a small chapel known as Santa Maria in Tempuli in Italy, only to have the icon miraculously return to its original place. In 1221, when the nuns of the monastery were to be moved to another community at San Sisto, they hesitated to leave, and would only go on the condition that the icon of Our Lady go with them. There was great concern that the image would again return on its own to Santa Maria in Tempuli. However, the famous St. Dominic, who we have to thank for the traditional Rosary to Our Lady, solved the difficulty by carrying the image in his arms in procession to its new home where it remained until 1575. It was later relocated again, always remaining under the care of the Dominicans. The chronicle of Sr. Salomona, recorded, in 1656, that the image had been painted in the Upper Room by St. Luke, following the out-pouring of the Holy Spirit at Pentecost. She now intercedes for us as Mother of the Church before the throne of God in an unprecedented way as “Advocata” — the one who defends or pleads the cause of another — their champion. In the fifth century the icon of Our Lady was described in an epistle of Bishop Epiphanios of Cyprus: “It was of medium size…and her complexion was that of a wheat grain. “She has amber eyes, dark brows, pupils like olives, a slender nose and rose-colored mouth.” While later icons of the Blessed Mother portrayed her together with the child Jesus as “Mother of God,” in this icon, although Jesus is not seen, her hands indicate both her intercession for us, and “the way” to her Son. Paul Badde reminded me that the Latin verb ad-vocare means call over or summon in English. “So, the Advocata is the one who is there when you call her.” She is cloistered behind the grate — in the world but not of the world — and together with the Dominican nuns, our “Advocata” will forever plead our cause before the Face of God, if only we call on her and seek our Mother’s face. 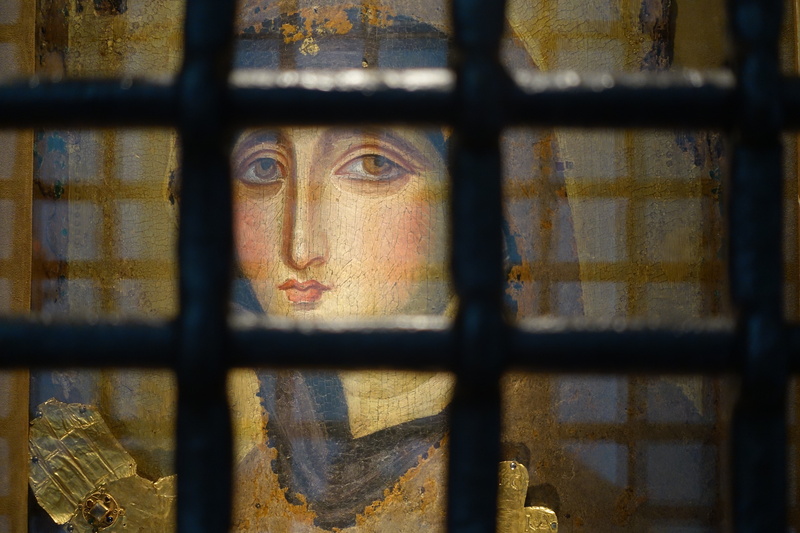 At an almost forgotten Roman monastery, our correspondent discovered a century-old icon of Mary. It is supposed to be the legendary portrait of the Mother of God, which Luke, the evangelist, painted on the cross after Jesus’ death. The “Advocata” is not a lawyer in the usual sense, but an ancient picture on fragile, worm-eaten wood. Still, I discovered her when I needed a lawyer again. The phone rang as I stood in front of her, and I turned it off immediately. Otherwise no noise disturbed us. Years before I had decided to visit this picture as soon as I came to Rome, since Bernhard Maria, a monk from Mount Zion, had recommended it to us in Jerusalem. 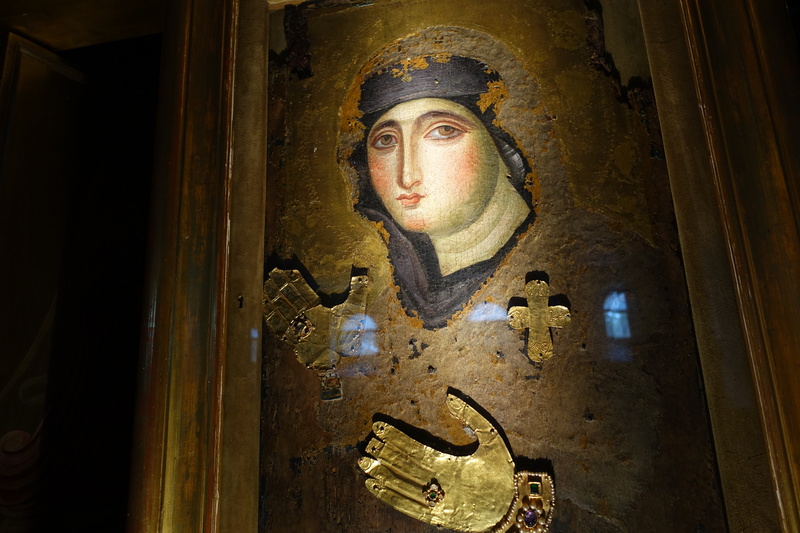 Just then, in a crooked house behind the Armenian quarter, we discovered a dark image of Mary on deerskin, of which the Syrian archpriest assured that it was from Luke, the evangelist, himself. Was not the claim ridiculous? “Oh, a Lukas icon”, Bernhard Maria only smiled. He knew twelve such pictures, having seen them personally and by hearsay, of which the most venerable was to be in Rome, in a monastery on Monte Mario. Of course, nobody in Rome knew anything I asked when we arrived, nor did I find a photo of it. No travel guide had the picture in the program, even the worldwide network gave no information. The Advocata simply could not be found. I had almost forgotten about it when last year an email appeared on my screen in which a friend from Aachen wrote to me: “For Christmas I will send you this beautiful icon (from the Rosary Monastery on Monte Mario). I found it in the ‘Seven Luke Icons of Rome’, by Salesia Bongenberg from Fulda, left to me by a priest friend. She greets you from her other world. Could you use it? “Attached was a photo in which one could distinguish, in spite of the advanced deterioration of the wood, only the face and one hand of the Madonna. Above the image was written: ” Advocata – summoned “. But not even the small book, which was in my mailbox a week later, was the address of the Rosary Monastery, nor did the telephone book help us, nor our pastor, nor any taxi driver. So we sat down somewhere on the long Via Trionfale on Monte Mario. It was here that the Emperor Constantine saw a monogram of Christ in the evening sky up here on October 27, 312, before beating the army of his opponent Maxentius the next day down the Milvian Bridge under the same “Sign of the Cross”. But now not even a Carmelite along the Via Trionfale had ever heard of the Dominican convent of St. Mary of the Rosary in the neighborhood, where the oldest icon of the city is supposed to be found. We gave up. “Let’s go back!” My wife said. Still, five minutes later we found ourselves in front of the monastery. A hidden inscription on the roadside, next to a locked gate, above a decaying Baroque church, between the trees, behind walls. At the back of the complex another door, also closed, but with a bell. “Ave Maria,” a voice from the intercom announced. No, no, we could not go to church right now. The house was a enclosed cloister for eternal prayer, and its inhabitants lived behind their self-imposed bars. But, we could come the next morning. As of seven o’clock in a side wall, a steel door was open for visitors for Mass at half past seven. The next morning, sun was filtering into the church. From the left of the altar, the singing of some voices were heard through a barred window. Next to it, through another heavy iron grille, is the image of the Madonna that we have been searching for so long. She looks sad, in the shadow of the overflowing jewelry with which pilgrims and devotees have surrounded her: with gold, precious stones, rosaries. “One moment!”, I hear a soft voice behind the picture, “wait!” On the left and right next to the Madonna, two small little windows unfold, then the whole frame starts to move and is turned from behind. The generously decorated image was the back, and it was just a copy of the true “Advocata” . The image itself, on the other hand, is at home on the side of the monastery, which has become a human vault. Now it turns to us, without any decoration of jewelry. A small lamp illuminates it from above. The icon is about 60 cm wide and 90 cm high. Fine cracks run through the warm complexion of the Madonna’s skin, and the coral-red lips, broken by many small areas that have been restored. The remainder was unable to be saved. Only this face has maintained itself in incomparable splendor between all decay and dissolution, infinitely familiar. Like the mother’s round face, meeting the gaze of her infant as she bends over Him for the first time. She does not look sad. Her hands are covered with gold and point to the right, as if to indicate one way. It is the first representation of Mary that the Russians call “Rimskaya” (The Roman) or “Liddskaja” (The one from Lydda). Rome is the only place, along with Sinai, where images have been found that have survived the iconoclasm of the Eastern Church. However it is in Lydda, today’s Lod, at the Ben-Gurion Airport between Jerusalem and Tel Aviv, of which it is said that the first image of Mary appeared during her lifetime, as stated in a letter from three patriarchs to Emperor Theophilus in 833. 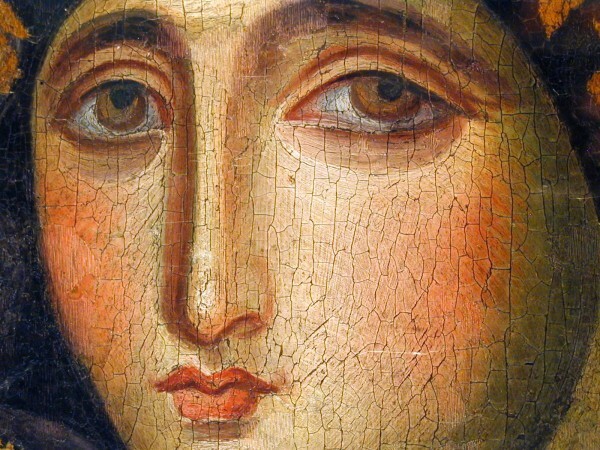 “It was of medium size,” says another Epistle of Bishop Epiphanios of Cyprus in the 5th century, “and her complexion was that of a wheat grain.” She has amber eyes, dark brows, pupils like olives, a slender nose and a rose-colored mouth. He could not have seen her in person; However, he could have seen this image and the soul-soothing gaze of those eyes. But where? In Rome, several trails lead to some images with exactly the same posture – which, however, make it clear that no other can match this image. They must all be copies, and only this is the original. Of all these family of images only the “Advocata” is painted with wax, that is: “encaustic”, in an ancient painting technique with hot wax and resin, whose secret was lost forever in the 7th century. Most likely, therefore, it resembles some mummy portraits found in some of the oases of Upper Egypt in the 19th century, all from the 1st to the 4th century, all painted in the manner of the Encaustic, and the older, the more expressive. The oldest of them is closest to “Advocata”. With her eyes as deep as wells, no person has come down to us is such an inspiring manner from the depth of time. The linden wood is so decayed that the age can not be determined. For more than 1000 years, the path of this Table has been well documented. San Domenico di Guzman, to whom Christendom owes the rosary, carried the picture on February 28, 1221, by hand, from S. Maria in Tempulo to his newly founded convent. In 1575 it migrated from there to SS. Domenico e Sisto in the Piazza Magnanapoli, from there it came in 1931 in the Rosary Monastery on Monte Mario. Before that, we have only legends which have illuminated its path through the darkness of time like a halo, of which a Sister Salomona in 1656 has gathered the most beautiful [legends] in a work entitled “Cronaca.” She had no doubt that Luke had painted the picture in the Upper Room in Sion. That is why Luke conveyed this gaze of she who had seen her Son being martyred to death next to her. Did not she then have to become the first icon of her Son among the apostles? John, not Luke, then took the picture from Jerusalem to Ephesus, from where it later came to Constantinople and Europe. Here Thomas Aquinas stated in the Middle Ages that for the faith of the Christians was not only the Holy Scriptures, but also that tradition played an essential role. As a special example of authentic traditions, he pointed to the icon painted by Luke. Could he have meant something other than “Advocata”? He knew Rome and was Dominican, just a generation after Dominic, who had incorporated this icon into his order, which has found its last place today on Monte Mario. Before the Advocata was brought here, Franz Liszt composed his Christ Oratory in the house. The view over Rome is cosmic. The dome in the panorama of the hills almost lost since the “Hilton” hotel was built above the monastery, The image of Mary in this retreat of the Dominicans is still poignant, as on the first day, as a hidden wonder of the world. The story is not over yet, she says with an ageless look. Is not she just starting again? In any case, the nuns who keep “the sweet image in inseparable communion” are getting older and older. Of 13 sisters, five are over 80, one is 92. Water comes through some walls, the pipes are old and brittle, Sister Maria Angelica, the Mother Superior, cannot pay her debts, the phones do not work. She urgently needs donations and only knows how to beg her [Mary] in prayer. It is a little island in a world that — from a purely sociological point of view — is more in danger of extinction than the glaciers of Switzerland. When I turned my phone back on after our first visit outside the door, I learned that the case, for which I was looking for a lawyer, had just solved by itself. I turned around again. How breathtakingly beautiful she is! Mary “is our lawyer with God,” said Benedict XVI. on 11 September in Regensburg, therefore she received the title “Advocata”. I see how I have to go back to her (and maybe the Pope too). We will all still need them.